Context-awareness is a maturing area within the field of ubiquitous computing. It is particularly relevant to the growing sub-field of mobile computing as a user’s context changes more rapidly when a user is mobile, and interacts with more devices and people in a greater number of locations. In this chapter, we present a definition of context and context-awareness and describe its importance to human-computer interaction and mobile computing. We describe some of the difficulties in building context-aware applications and the solutions that have arisen to address these. Despite these solutions, users have difficulties in using and adopting mobile context-aware applications. 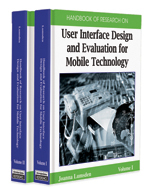 We discuss these difficulties and present a set of eight design guidelines that can aid application designers in producing more usable and useful mobile context-aware applications. Interaction Design: The design of the user interface and other mechanism that support the user’s interaction with a system, including providing input and receiving output. Usability Risks: Risks that result from the use of a particular technology (in this case, context-awareness) that impact the usability of a system. Design Guidelines: Guidelines or principles that, when followed, can improve the design and usability of a system. Mobile Context-Awareness: Context-awareness for systems or situations where the user and her devices are mobile. Mobility is particularly relevant for context-awareness as the user’s context changes more rapidly when mobile. Context: Any information that can be used to characterize the situation of an entity. An entity is a person, place or object that is considered relevant to the interaction between a user and an application, including the user and applications themselves, and by extension, the environment the user and applications are embedded in. Context-Awareness: A system is context-aware if it uses context to provide relevant information and/or services to the user, where relevancy depends on the user’s task.